Shop online for 1 bronco plastic models at discounts up to 24%. 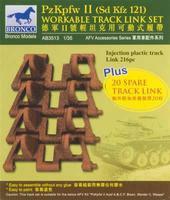 This is the 1/35 Scale PzKpfw II (Sd Kfz 121) Workable Track Link Set from Bronco Models. Suitable for Ages 14 & Older.